Our three geese sisters have moved into their brand new housing, it is an excellent upgrade from their last and they have settled in fantastically. It was all made possible by our dedicated team of volunteers. We all continuously assess the welfare of our animals and strive to make consistent improvements. 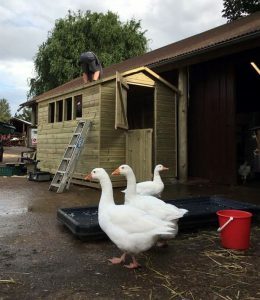 The volunteers decided the geese deserved even bigger and better, an enclosure which was firstly more warm and sturdy for the coming winter months. We scoured the internet in search for a shed fit for our beautiful birds. We thankfully stumbled upon Ace Sheds. The shed looked great and the specifications were perfect, so we got in contact straight away. They offered us a very generous discount and cut their estimated delivery time in half! Volunteers had a brilliant time demolishing the old goose house, equipped with nothing more than a hammer and a bit of elbow grease. The shed eventually came toppling down, was cleared away and was ready for recycling. Ace Sheds then arrived and did a tremendous job at installing it on site. 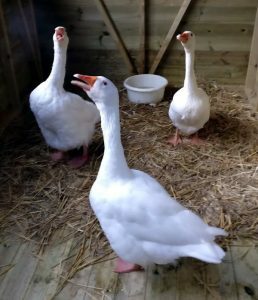 As most of you know, our geese, like all our birds, are free range. They spend most of their days exploring the yard together, so make sure you don’t leave any food in your buggy as they are sure to find it! The new shed is only used in the night-time to protect them from the elements and foxes while they rest. We are very lucky to have such hard-working volunteers who care so much for our animals. Welfare is one of our top priorities and we aim to improve every day. Heavy duty felt helps keep the shed water tight for longer. Extra thick cladding ensures the geese are kept warm. The extra thick framing adds to the strength of the structure. The four windows let in plenty of light. One of the windows has been modified so it can be opened and closed, which a mesh covering. This allows it to be cooler in summer and warmer in winter, while the mesh keeps foxes out. 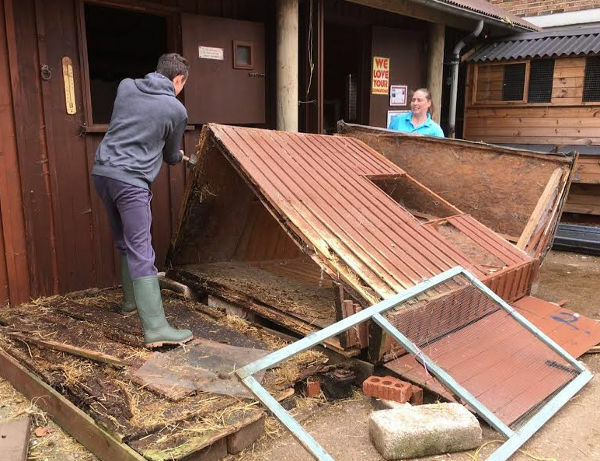 A stable door can be left open during day to allow a through flow to keep the insides dry. The wood is 100% pressure treated to keep it completely water-proof. There is more space, with plenty of room for their comfort. Easier access to make cleaning more efficient. We are very proud of this improvement and hope you come on down to have a look for yourself!